The Legacy of Muslim China is the legacy of Muslim Kung Fu. Muslim Masters have trained continuously and arduously, venturing the never-ending journey towards physical and spiritual perfection, poised by serving a lifelong inspiration to their Muslim communities and the proud nation of China. They have perceptively disseminated their knowledge of the art, unreadily revealed by the ancient masters to only a few truly dedicated students who were allowed a glimpse of a particular technique, after their sincerity and total devotion for the art was thoroughly tested. The high caliber of Muslim Kung fu Masters was deemed with an open mind and excelling to a high degree in both a combative and a philosophical approach. Figure 1. 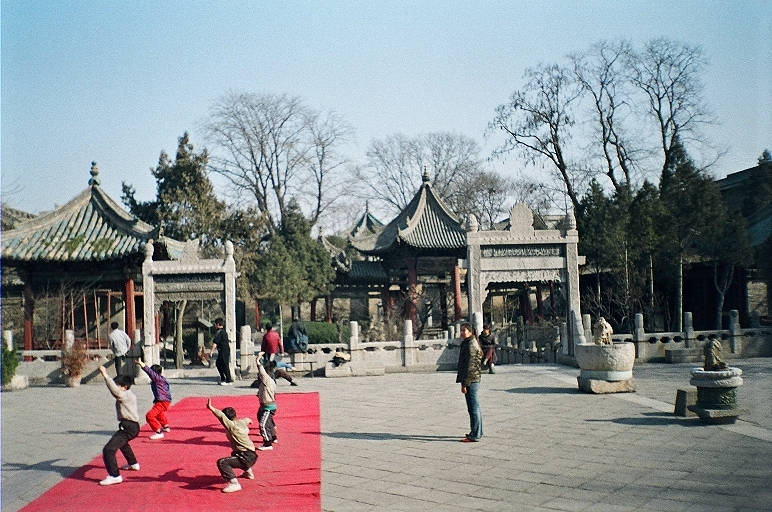 A group of school children practice martial arts formation under the watch of their teacher in the Great Mosque of Xi'an. A 1400 year chronology of Islam in China is nearly as old as the following reminder by the Prophet Muhammad: "The strong man is not the one who throws people in wrestling. The strong man is the one who has control of himself when he is angry". Such "hikmah" (wisdom) adhered to by Muslim Masters for centuries, intertwined with self development and cultivation of "Chi" (inner energy) utilized to tame the animal within and to help further their mastery of martial arts. Muslim Masters have succeeded in harmonizing the internal and external form of Kung fu, thus successfully remaining akin to their original faith, applying tremendous "ijtihad" (effort), in producing ultimately effective and indigenous martial arts of their own, based on their religious (Islamic) creed, ethical manner, free from supposition and animosity. Coined under the term "Jiao-men", meaning sect fighting, ascribed by the "Hui" spiritual elders as "holy practice", in defense of their plight and to foster endurance among Muslim youth who were taught within boundaries of Mosque court yards, it sporadically sprouted with the "Muslim Fist" style, which later diligently produced a galaxy of Muslim Kung Fu Masters. Indigenous Muslim martial arts were often epitomized with distinctive Islamic (Arabic) names and their technical effectiveness peaked within Kung Fu circles. Their ubiquitous presence immediately became transparent throughout China, from winning many free style fighting competitions to training senior bodyguards of China's president. Muslim interpretation of Kung Fu literally ranked amongst China's most predominant styles, marveled by many for its originality in the art of expressing the human body, gracefully embraced by Shaolin monks and other schools of "Quanshu" (i.e. pugilistic art). The Chinese Muslim legacy experienced spontaneous struggles amidst economical strife, vested from their Arab and Persian ancestors who first docked the famous ports of Guangzhou and al-Zaytun (Quanzhou), from their perilous sea and land journeys, in search of auspicious trade, which transformed them to Masters of the early medieval East and West trade. Centuries later Master Cheng Ho, a well known Muslim figure who traversed far and wide, successfully combined both his martial arts expertise and commander-in-chief of the Ming's navy. The following brief introduction of Chinese Muslim Kung Fu Masters, denotes a genealogical legacy descending from generation to generation, transmitting their covert experimental knowledge and science, spooned from a treasure trove manifested from a Sino-Islamic heritage and philosophy.